Oakland Raiders is a big name in professional football teams in America. This team from Oakland, California is a part of the National Football League and plays in American Football Conference in its Western Division. The team started out in 1960 as a part of American Football League and joined National Football League in 1970 at the merger of AFL and NFL. Oakland Raiders tickets are a favorite of every sports fan in Oakland and in California who fill up the stadiums when the football season is on. And this season is no different. Tickets for the upcoming games have been selling since the Raiders schedule for the 2018 season was put up. As the franchise enters into its 59th season this year, under head coach Jon Gruden, fans could not be more excited. Games to look out for include the highly anticipated face off between the big rivals Raiders and the Chiefs, this December! Oakland Raiders struggled as a team in the beginning but when Al Davis was appointed the head coach of the team, Raiders started up the steps of success so much that from 1963 to 2002, Raiders lost mere seven seasons. When Raiders were a part of AFL, they appeared in one Super Bowl, won three Division titles and one League Championship. As a part of NFL, Raiders have brought home twelve Division Titles and three Super Bowls. Al Davis joined as the head coach of the team in 1962 as one of the youngest members to hold this position. He proved a lucky charm for Raiders as he started implementing new techniques and tactics to the team which brought the falling Raiders to a point where they became one of the most successful franchise of NFL. The team currently plays in Oakland-Alameda County Coliseum however; its home arena has been changed from Kezar Stadium, Candlestick Park and Frank Youell Field to Los Angeles Memorial Coliseum. Oakland Raiders became Los Angeles Raiders when the team shifted to Los Angeles for some years but changed back to its old name in 1995. Raiders are also called "Team of the Decades" and "The Silver and Black", the latter one because of the silver and black colors of their uniforms. Oakland-Alameda County Coliseum is also known as "Coliseum". The arena was previously known as McAfee Coliseum and Network Associated Coliseum. Oakland-Alameda County Coliseum has been the home arena of Raiders first from 1966 to 1981 and then from 1995 till present. The Coliseum is also the home arena of Oakland Athletics which is a team of MLB and previously served as the home arena of San Jose Earthquakes, a team of MLS. The 2009 CONCACAF Gold Cup was also held at the Coliseum. The stadium is a state-of-the-art piece of architecture and was opened for public in 1966. The stadium has a seating capacity of more than 63,000 for a football game, more than 35,000 for a baseball game and more than 47,000 for a soccer game. The stadium has separate club and luxury seats and has all the facilities a modern arena should have. Thirteen players of Oakland Raiders have got inducted in Pro Football Hall of Fame. Among these thirteen players are Marcus Allen, Bob Brown, Mike Haynes, Howie Long, Jim Otto, Art Shell and Rod Woodson. Currently, Kyle Roller, Jason Campbell and J. T. O’Sullivan are the quarterbacks of Raiders; Zach Miller and Brandon Myers are at the tight ends; Michael Bennett, Michael Bush, Rock Cartwright, Darren McFadden and Marcel Reece are the running backs; Darrius Heyward-Bey, Johnnie Lee Higgins, Nick Miller, Louis Murphy and Chaz Schilens are the wide receivers; Khalif Barnes, Cooper Carlisle, Robert Gallery, Mario Handerson, Daniel Loper, Samson Satele and Langston Walker are the offensive linemen; Desmond Bryant, John Henderson, Tommy Kelly, Jarvis Moss, Richard Seymour and Matt Shaughnessy are the defensive linemen; Ricky Brown, Bruce Davis, Quentin Groves, Thomas Howard, Sam Williams and Kamerion Wimbley are the linebackers while Nnamdi Asomugha, Tyvon Branch, Hiram Eugene, Michael Huff, Chris Johnson, Mike Mitchell and Stanford Routt are the defensive backs of Oakland Raiders. All the players of Raiders are energetic and highly talented and are a major factor in the success of the team. Oakland Raiders tickets are the first choice of every football fan in Oakland. Raiders have famous and long rivalries with Kansas City Chiefs, Denver Broncos and San Diego Chargers in their Division and a geographical rivalry with San Francisco 49ers. Games of Raiders with these teams always attract the biggest crowds. Other old and famous rivals of Raiders are New England Patriots, New York Jets and Pittsburgh Steelers. Because of the rich winning history of the team, the games of Raiders are always highly anticipated and because of a huge fan base, Oakland Raiders tickets are always the quickest to sell out. The fans of Raiders are named as "Raider Nation" and these fans dress elaborately on the game day to show their support to their favorite team. The Oakland Raiders and the Denver Broncos have a very heated rivalry. This dates back to the days of the AFL when they were members of the same division. As a result of the AFL-NFL merger, these two teams made the switch to the NFL and joined the AFC West. The regular season head to head between them puts the Raiders in front. They have won sixty one games compared to the Broncos’ 51. They have met twice in the postseason too and both teams recorded one win each. Just like their rivalry with the Broncos, the Raiders’ rivalry with the Los Angeles Chargers also goes back to their time in the AFL. The Raiders lead the regular season head to head record 62-51-2. These two great rivals have also squared off once in the postseason and on that occasion, the Raiders came out on top too. The rivalry between the Oakland Raiders and the Kansas City Chiefs is one of the fiercest in the National Football League. In their regular season head to head record, the Chiefs’ are ahead with a 60-52-2 record. The Raiders and the Chiefs have also played three postseason games against each other. The Chiefs lead the postseason head-to-head 2-1 as well. How many Super Bowls have the Oakland Raiders appeared in? The Oakland Raiders have played in five Super Bowls, winning three. How much are Raiders tickets? There is no fixed price for Oakland Raiders tickets. Please check out the complete list of prices on the relevant page. When did the Raiders become an NFL team? The Oakland Raiders joined the NFL in 1970. After sixteen years, Jon Gruden is back at the Oakland Raiders. His first stint with the Raiders began in 1998 and ended in 2001. He was their coach in 2000 when the Raiders landed their first division title since the year 1990. After leaving the Raiders, he became the head coach of the Buccaneers and led them to the Super Bowl title in 2003. The team he beat to lift the Vince Lombardi Trophy was the Oakland Raiders. Now that Gruden has returned to the Raiders, it feels like he has some unfinished business to take care of. It certainly will be very interesting to see how this pans out. Michael Crabtree of the Oakland Raiders and Aqib Talib of the Denver Broncos have both been handed two games suspension without pay because of their fight in the game between these two sides. Both Crabtree and Talib were ejected because of that but now the two have landed extra punishments for the unsavory incident. There is no love lost between these two players either as they went at it last season too. According to reports filtering in, both Talib and Crabtree will be appealing the suspension. Football season is here and is packed with epic matchups. You can catch all the action live as it happens. Next event featuring Oakland Raiders will be NFL Preseason: Oakland Raiders vs. Los Angeles Rams (Date: TBD), held at the Oakland Coliseum in Oakland. As of now, the last event, Oakland Raiders vs. Chicago Bears is scheduled for 6-Oct-19 at the Tottenham Hotspur New Stadium in London. For complete itinerary of events, please visit our website. The average price for Oakland Raiders Tickets start from $140. The minimum get in price is $6 for Oakland Raiders Tickets at the State Farm Stadium, Glendale. For a detailed look at ticket prices and amazing discounts, visit our website. 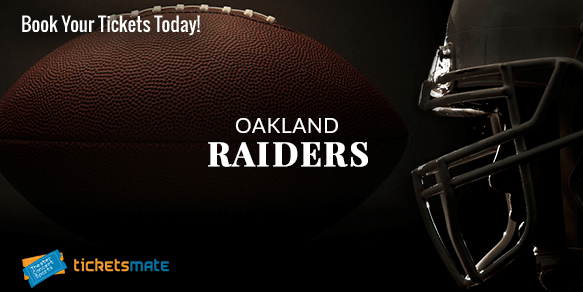 Use Event18 as the discount code and get up to 70% discount on Oakland Raiders tickets. This is a last minute opportunity to get the discounted tickets for Oakland Raiders. Q:How many championships have the Oakland Raiders won? A:As of 2017, the Oakland Raiders have won three Super Bowls. The captured their first one in 1976 against the Minnesota Vikings while they won their second and third in 1980 and 1983 by defeating the Philadelphia Eagles and the Washington Redskins respectively. The team has also clinched four conference and fifteen division titles so far. The Raiders are currently coached by Jack Del Rio. Q:What if I do not get oakland raiders tickets 2018 in time? A:You will definitely get your Oakland Raiders Tickets delivered at your doorsteps within due time, but if there is any delay you may contact our helpline. Q:Can i buy cheap raider tickets from your website? A:Yes, you sure can buy cheap Oakland Raiders Tickets from our website. Look through our page for details and order your tickets from there. Q:Till when can i get cheap discounted raiders tickets? A:You can get oakland raiders Tickets on discounted rates before the date of the event as long as they are not sold out. Check out the details online and place your order right away. Q:What is the policy to get oakland raiders tickets discounts code? A:There is no specific policy for getting discount codes of oakland raiders Tickets. Anybody can get them by following simple instruction available on our page. Q:I am looking for the best deal of Discount Raiders Tickets. What is your offer? A:We are offering oakland raiders Tickets with special discount deals. Check the details on our page and place the order. Q:Do you offer oakland raiders discount on your website? A:Yes, we do offer oakland raiders Tickets at discounts on our website. You can get discounts by using the codes mentioned on our page. Q:I would like some raiders tickets? A:You ca have you Oakland Raiders Tickets from our sport tickets index now! Q:I would like oakland raiders discount tickets? A:You can get the discount tickets from our Oakland Raiders page now! Q:How much discount oakland raider tickets offer? A:You can visit our Oakland Raiders Tickets page to find out. Q:I need to get some raiders tickets but will they be here in a week? A:Your order for Oakland Raiders tickets will be processed in the same business day and your tickets will be delivered to you in a weeks time. In case of any exceptions you will be duly informed. Q:Can I get really cheap oakland raiders tickets? A:You can pick Oakland Raiders tickets at affordable prices from us. Q:If I buy raiders tickets will they be on the home side? A:You can have a look in our Oakland Raiders tickets inventory to get tickets according to your preference. Q:Is this a safe site to buy oakland raiders tickets from? A:Absolutely! You can be assured that our tickets are 100% guaranteed, so you can shop at this site with complete confidence. We take customer satisfaction very seriously. In addition, we are licensees of TRUSTe (which governs our rights to reuse customer information). Furthermore to provide our customers a HackerSafe experience, we are members of McAfee SECURE. So do not hesitate, and buy your Oakland Raiders tickets. Q:Where can I buy oakland raiders tickets from? A:Oakland Raiders tickets are right here with us so buy them now! Q:What is the best deal you can offer me for discounted raiders tickets? A:You can check the Oakland Raiders tickets index and pick the passes which suit your budget. Q:Is it possible to book oakland raiders v kc cheifs tickets with no service fees and no shipping charge? A:You can't skip the additional charges as the brokers will not process your order for kansas city chiefs Oakland CA tickets without getting the full payment. Q:Can i receive oakland raiders for tomorrow's game in time? A:You have a couple of options to get Oakland Raiders tickets in time, you can either place an urgent deliver order or have them through will call. You have to add "special instructions" in your order in form of your phone number and the broker will take care of the rest.